2 photographs : b&w ; 18 x 22 in. File consists of two copies of a composite photograph of the 1925 Dalhousie First Hockey Team. The photograph consists of portraits of A. R. Morton (Assistant Manager); R. S. Gass (Manager); J. F. Bates (Centre); W. Creighton (Right Wing); G. A. Ernst (Right Wing); A. E. Coleman (Right Wing); A. A. Dunlop (Captain, Left Defence); J. Lewis (Goal); R. T. Wilson (Right Defence); P. T. Hickey (Forward); H. de M. Haslam (Left Wing); and G. W. Moore (Left Wing). 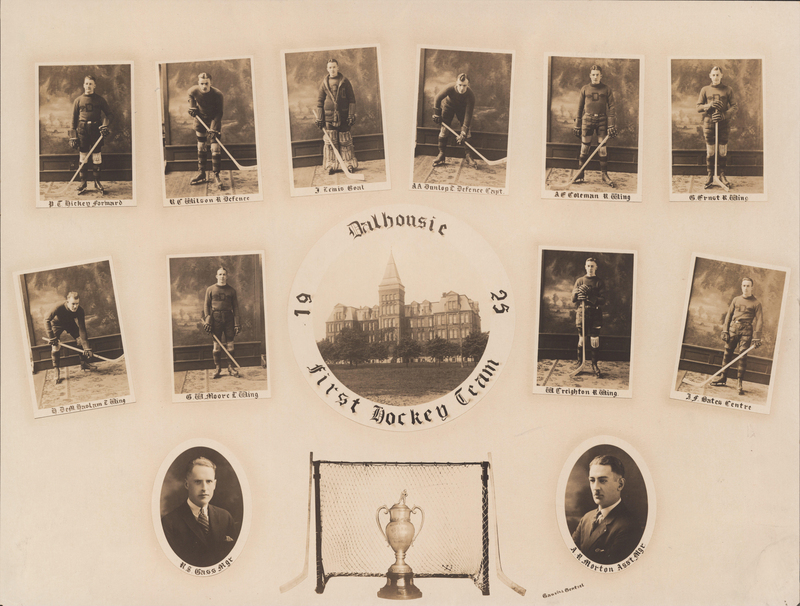 The portraits are arranged around a photograph of the Forrest Building and a photograph of a hockey net, hockey sticks, and a trophy. One copy is more faded than the other.